What I like is the channel logos.. 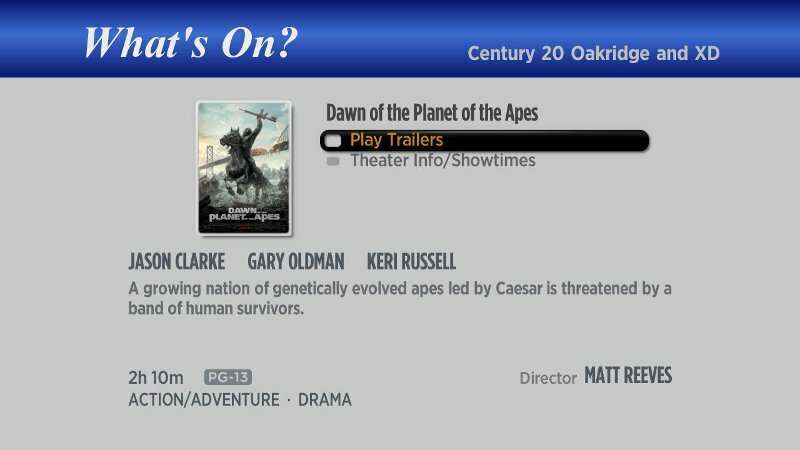 The short description and most valuable after the (cc) is the word NEW.. or not the word NEW.. You just don't know how important that is.. And the videos play in the movie listings.. It's all good damit and hopefully will remain a private channel.. Thank you.. 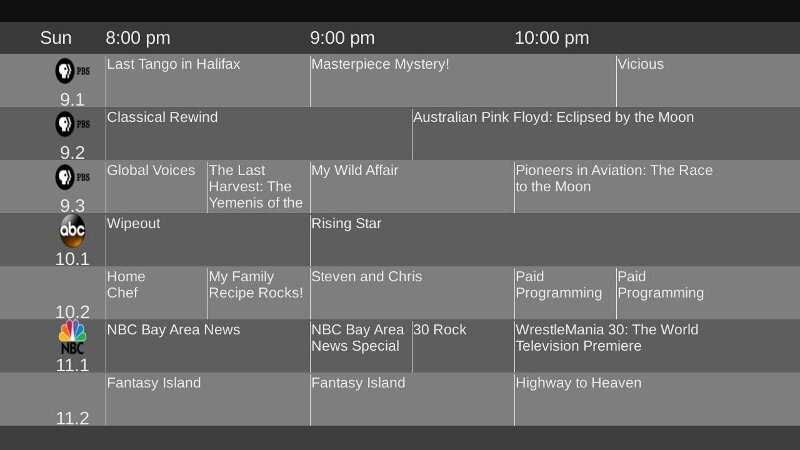 The latest version of the What's On Channel now features a 3-hour TV listings grid. Press the "*" key or go to the Settings menu to switch between the new grid format and the single-program format. Last edited by belltown on Fri Feb 12, 2016 12:01 pm, edited 1 time in total. Thanks to belltown for the major update, much appreciated! And still free, too. It certainly makes the TV listings more convenient to use. Just curious, was it a lot of work? I assume you had to custom design the grid layout, as opposed to using one of the screen templates? Other than USTVNow, I wish other Roku channels dealing with live TV (previous Aereo, DishWorld, FilmOn, NimbleTV, Simple.TV, Skitter TV, Tablo, wow, fibersat, dssmedia, chinese, etc) could also provide a 2D program guide (EPG). Are they just waiting for Roku to provide the template? Other than USTVNow, I wish other Roku channels dealing with live TV (previous Aereo, DishWorld, FilmOn, NimbleTV, Simple.TV, Skitter TV, Tablo, etc) could also provide a 2D program guide (EPG). Are they just waiting for Roku to provide the template? Thanks, beq. Yes, it's a custom layout, an "Image Canvas" to be exact. Not too much work (but that's all relative I suppose). I don't know why other channels do what they do. Sometimes, I'm baffled when I see some of the work (or lack thereof) that goes into some of the "official" channels. Like the 'TV Guide' channel, for example, which doesn't actually contain a TV Guide, just a bunch of random video clips. Crazy question. .. would you be willing to contribute to the media browser project? They now support live tv, but are in desperate need of a grid guide. If you have never heard of it, media browser is a free server program and roku app that allows you to stream local movies, TV shows, and now even live TV in hd. It's pretty cool, and has a ton of momentum with frequent updates. Thanks. I'm the Media Browser project lead. Our server supports streaming Live Tv and there is a lot of demand for a presentation like this within our Roku app. Send me a PM with your email address and I'll send you my code for the TV listings display. It wasn't really written to be a reusable component; however, you should be able to adapt it to work with your own data. This is a great App and service, huge thanks as this is what I envisioned when I planned to cut the cord and move to a OTA/Roku/SlingTv setup. The movie segment is cool but I the power of this app is in the TV guide Favorites segment. As more options are offered for streaming channels this is the only way to consolidate your personal setup. I use 20 OTA channels, 20 SlingTV channels, HBO_OD(slingtv) and FxNow. So I select my local cable provider and personalize my list to cover all 4 sets of channel inputs into one guide. Would you consider swapping the layout priority to emphasize the TV guide? I think as it being the focus it would bring a log more users into the fold to utilize this App, or allow for customization presentation like the Roku home channel? It could even be preset as Movies first or TV first so its just the choice of 2 layouts. Thanks for the considerations, and for all the work into this great App. The latest What's On Channel build (2.5/01) now sets the focus on the main menu to the item that was last selected the previous time the channel was used. 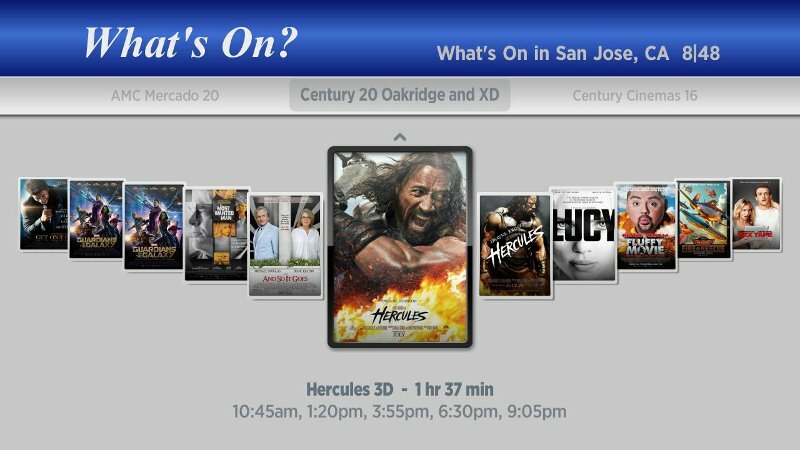 So if you select the TV listings, for example, then the next time you run the channel the TV listing menu item will have focus, thus avoiding the need to scroll over from the movie listings menu item. Great channel! I'm working on a project that could use something exactly like this. I saw you mentioned you used the Image Canvas component to build the grid. How did you handle text wrapping and knowing when to put in "..." to truncate a string? If a line does have to be wrapped, are you outputting multiple substrings of the original string at multiple locations or just using some built-in wrapping feature? I've been playing with using the "GetOneLineWidth" function but it doesn't always work correctly to determine if the line should be truncated. If you don't mind, I would love to see how you got this work behind-the-scenes. I have some example code that I just uploaded to GitHub that includes the code used to implement the TV grid listings. Feel free to use it in your own project. Note that the original code is almost 4 years old. If I were to do this today, I'd probably use the 2D API or the EPGGrid Component of the new Scene Graph API to implement the grid. Thank you belltown for your insight into this problem. I did not know about that EPGGrid component. 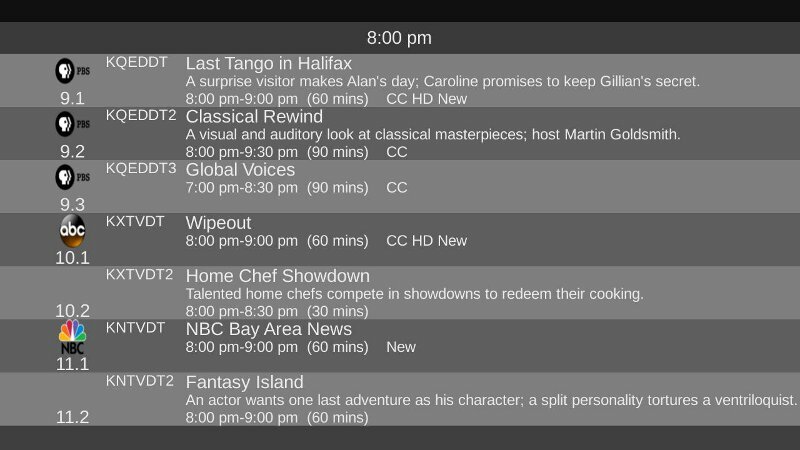 It looks great for implementing a TV listings grid. I had looked at the 2D API as well, but it looked like reinventing the wheel to make a simple grid.